Born on February 7, 1920 in Olean, New York she was the daughter of the late Salvatore and Josephine Minneci Cucchiaro. On April 25, 1942 in St. John's Roman Catholic Church, Olean, New York she was married to Mr. John Miller who predeceased her on January 23, 2009. Mrs. Miller was employed at the former Salamanca District Hospital for over 20 years retiring as a Dietician. 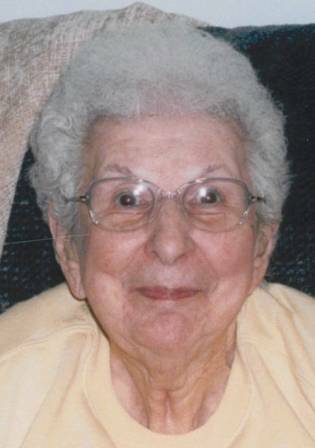 She was a member of the Our Lady of Peace Parish, Salamanca, New York. She enjoyed cooking, baking, reading and loved to collect dolls and knick knacks.. Surviving are 2 daughters, Christine Dunkleman, Winter Park, FLA, Sandra Thompson, Winter Garden, FLA; a son, John (Mary) Miller, Olean, New York; 8 grandchildren; 19 great grandchildren; 2 sisters, Marie Walsh, Lincoln, California, Josephine Bell, Punta Gorda, FLA; a brother, Robert Cucchiaro, Olean, New York; several nieces and nephews. She was predeceased by 3 brothers, Joseph Cucchiaro, Andrew Cucchiaro, Salvatore Cucchiaro and a sister, Bette Cucchiaro. Friends may call at the O'Rourke & O'Rourke Inc. Funeral Home, 25 River Street, Salamanca, New York on Monday from 12 â€“ 1 P.M. at which time funeral and committal services will be held with Rev Patrick Melfi, of Our Lady of Peace Parish, Salamanca, New York, officiating. The family suggests memorials to the donor's choice. Flowers are gratefully declined.